Unlimited Class. 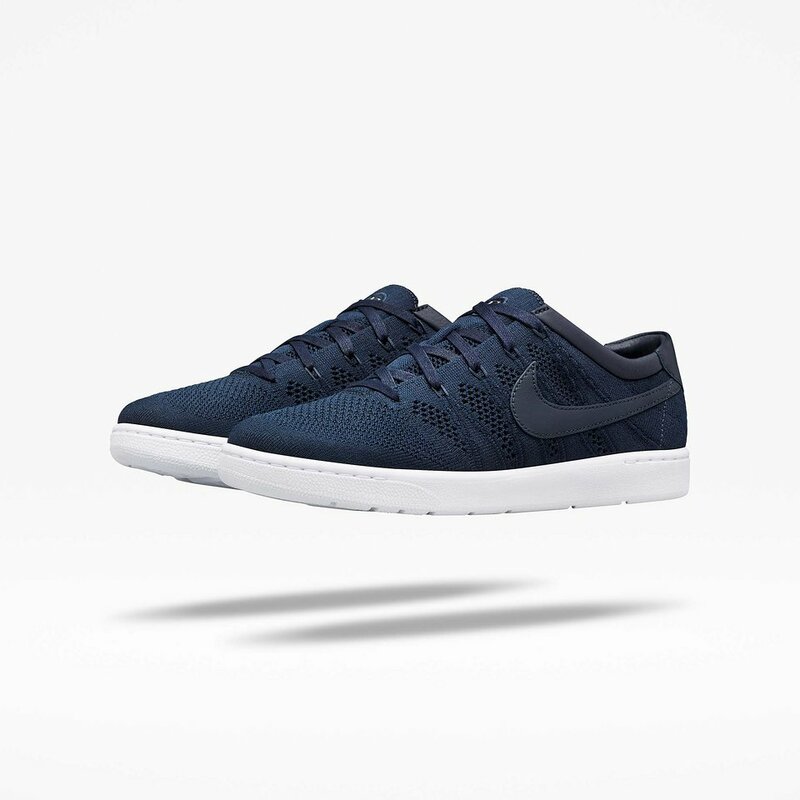 NikeCourt X Roger Federer Collection. Over an almost two-decade career, with nearly 100 tournament titles, and over 300 weeks at #1, Roger Federer’s commitment cannot be questioned. His unlimited ability to push his performance also pervades his passion for style. Working closely with the NikeLab design team, the tennis great collaborated on a collection inspired by his unwavering eye for detail. 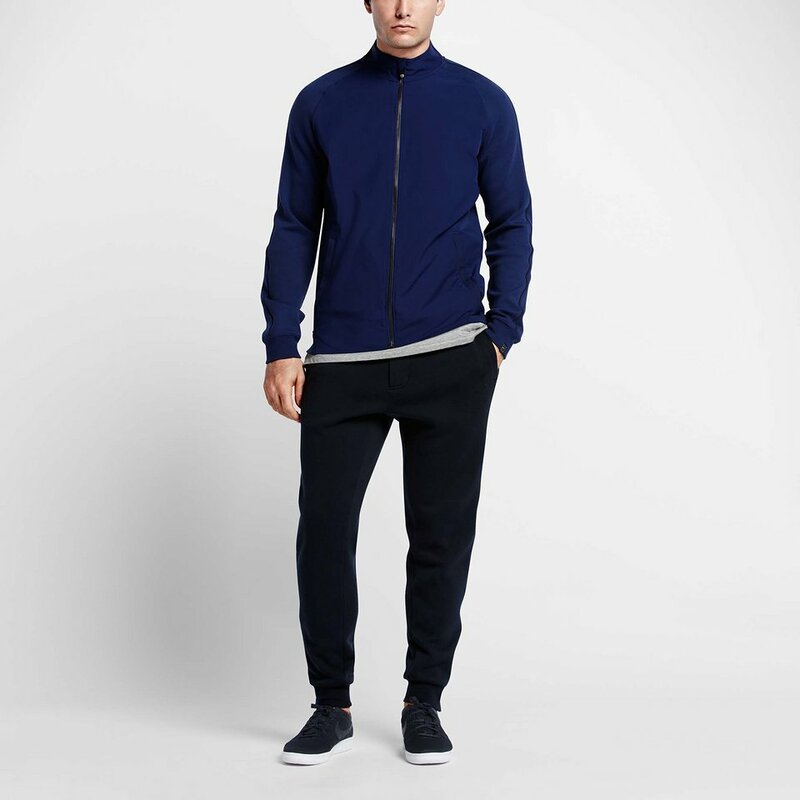 Similar to Federer’s on-court style, the fine points of the NikeLab x RF off-court collection, led by a N98 jacket and polo shirt, feature intricate attributes throughout. 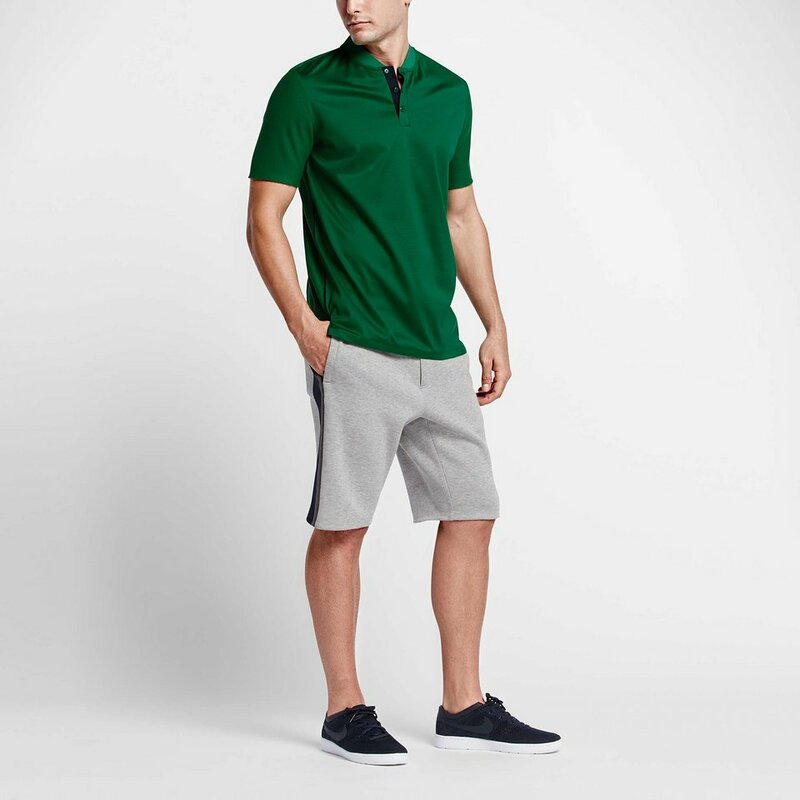 Subtle RF branding amid reflective hints add a component of distilled discovery, while sartorial statements such as mixed, dual-stretch woven fabrics with movement conscious construction help complete Federer’s championship approach to sport style. 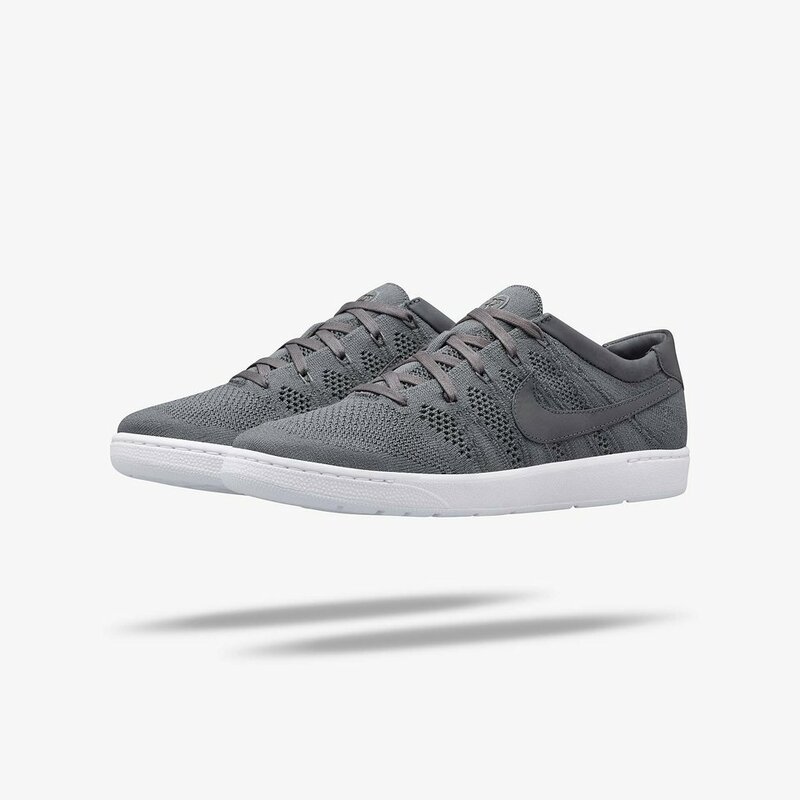 NikeLab’s Summer of Sport continues with Roger Federer’s Unlimited Class. The NikeCourt X Roger Federer Collection will be available at the NikeLab 1948 LDN store on June 23, with releases online and in select Nike stores on June 30. Federer took time to give an interview for Yahoo, elaborating on his inspiration for an off-court collection, how his personal connection are incorporated in the designs, and his first experience working on a product for something entirely new. Check out the full transcript from the interview below. What inspired you to do an off-court collection? Roger Federer: Well, not that I really wanted to, but Nike had asked me, and I take it as a big honor. I’ve designed on-court clothes before, and Nike came to me now to ask if I’d be a designer for off-court for a new collection based on tennis-inspired sports style. So I was like, “What does that mean, exactly?” And they said, “Well, we want to use your designing, ideas, and how you dress on court and away from it — you know your style — and we want to combine tennis’s heritage, and let’s see what you can do for the street.” And I was like, “My God, are you kidding me? I would love to do that!” So that’s how we got started, and this is the first collection, which I’m very excited about. And it was a work in progress, and I think it actually came out really nice. What are some personal connections incorporated in the designs? I guess you have to look at the grosgrain that I used in the tuxedo-inspired look. That came about when Nike chucked everything out of the door back in 2007 at the U.S. Open, and said, “Let’s do an all-black look, you’re a Darth Vader, tuxedo-wearing, James Bond kind of guy.” And this was never really done before — the all-black socks, shoes. So we used it again down the road. This whole grosgrain, tuxedo-inspired kind of look is something that I really like — that’s something personal to me. And then we have the five dots on the shirts as well. It’s a story where I played with my Dad when I was younger, and I always had a very hard time understanding discipline. I was disciplined when I was in the mood, but not when someone else was in the mood. So it took me some time, and my Dad was so frustrated when he would play with me. He wasn’t my coach, he was doing me a favor hitting with me so I wouldn’t have to hit against the wall all the time. And one time, he just said, “OK, you know what, if you continue being this way and acting this way, then I’m just going to leave.” And then I continued behaving the way I did and he said, “I’m leaving” and he left a big 5 Swiss franc on a white bench. I sat there for half an hour, thinking he went to get a drink at the restaurant and then I’d see him. Then I checked the restaurant parking lot to see if the car was still there, and I realized he’d left. So I was like, “No way! I can’t believe he did that,” so I had to walk 10 minutes to the tram, then take the tram to the bus, and it took me like an hour to get home. I figured [when I saw him, that] he was going to say, like, “I’m sorry,” or maybe that “This was a bit rough, but I had to do it,” but he was just still so angry and so disappointed that in actually a symbolic way, this was maybe a wakeup call. This five-dot logo now reminds me of that. And to listen is a good thing when you’re younger, and still today, you can always learn more. It also looks like the Swiss cross, so this is a very personal detail that we have in the collection. Between your training, parenting, and various other commitments, how did you find time to collaborate on a clothing collection, let alone send an email? It’s all a matter of what’s important to you. You can always make time, I believe, in life. So yes, I’m a very busy person, but I feel like you organize your life in a way that you can do things that you really enjoy doing, and I enjoy doing different things other than just playing tennis and practicing. I feel like I need much more than just that in life. That’s why my family and friends are so, so important. But I also enjoy being outside of the box a little bit, and tapping into other areas of life. Like I was fortunate enough to go the Oscars this year, or if I can go to an art gallery, or if I can go to a restaurant with my wife, or I can go to the zoo with my kids. So if I can design clothes and be a designer and collaborate with inspiring people and it’s very cool, then I will find the time. I hope this is only the beginning for many more things. But we’ll see how it goes, and I hope the people will like this collection and they’ll want more of it in the future. Giving technical feedback on a product is something you have experience with. 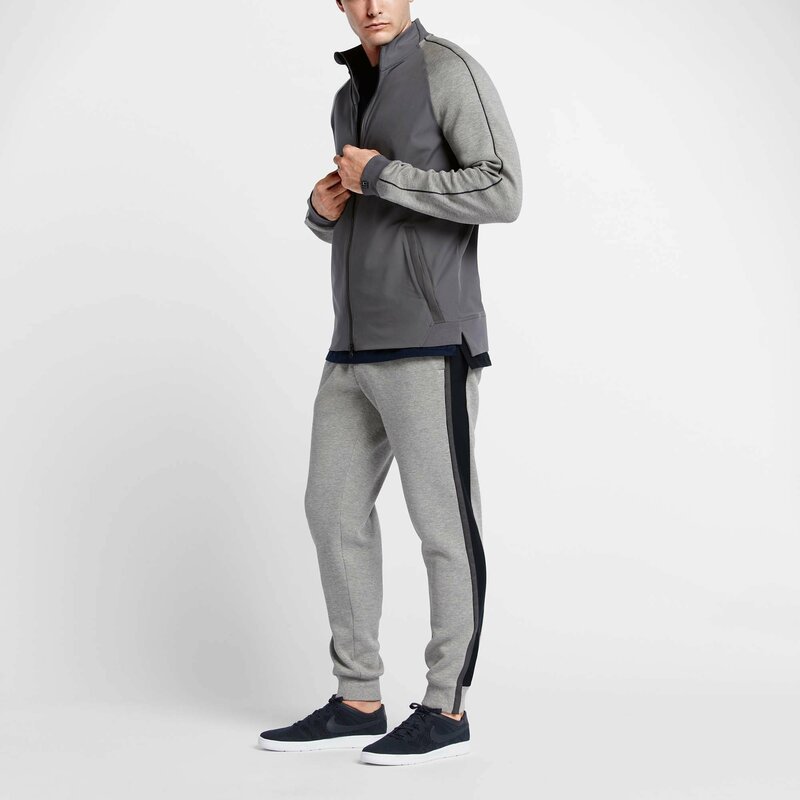 But what was it like working from scratch on athleisure? It was not so simple. I’ve had a lot of experience from designing my on-court stuff, which I’ve always gotten into the details: I really like color, changing from T-shirts to polo shirts, different materials, and so forth. I’ve always been into that stuff, so it’s not something that’s that new. I wouldn’t say it’s overwhelming, but when I came in, I realized how much more you could do from an earlier part in the process, and the more personal it becomes. I am learning while I’m doing this, and I think every collection that’s going to come after this is going to be more and more personal. On court, you typically wear brighter colors, like teal, bright orange, neon pink, but this collection is more muted. Was this intentional? Do you personally wear more neutrals off the court? I think the first collection, I wanted it to be a little bit more subtle. I wasn’t prepared to take massive risks — at least, not yet. For me, it wasn’t so easy to say like, “OK, we’re going to do lime green or something.” So I thought: Let’s start subtle, let’s make it about the details, let’s make it colors that everybody can really feel comfortable in, different kinds of grays and different kinds of blues, and so forth. I like those colors a lot when I’m not wearing Nike. Let’s say, out and about with a jacket and blazers and suits and ties and so forth, so I guess that’s where the inspiration for these colors came from. But as we’re moving on, clearly there [are] going to be more colors. You mentioned that it’s your personal mission to make tennis stylish. What’s your plan? I do believe we’re very lucky as tennis players. I change my collection with Nike 12 times a year, so I have a lot of different outfits, cool outfits, so I’m very lucky. But I feel like it’s really important to bring style to the game of tennis, because we have this great history, heritage, where we used to walk around or play in long trousers, jumpers, and we’d walk onto the court with jackets like I did — I tried to bring that back — and I feel like now we’re moving into a new generation where we can take more chances again. For me, it’s very important to have the off-style look. You know, I have to get used to it! To be honest, I was quite uncomfortable wearing it early on in my life. With the Davis Cup Team and official dinners, I didn’t know how to tie my tie, and I thought my suit was way too big, and I didn’t feel comfortable in it. You get inspired by the people you meet, the places you go somewhere in a suit and tie — wherever I go, like the beach. So you have your different styles for the different places that you go to. And I’ve been fortunate enough to meet a lot of interesting people and being in interesting places that have inspired me to dress away from the game of tennis. … I feel like if I put a pair of jeans on after tennis, people look at me and always ask me where I’m going. 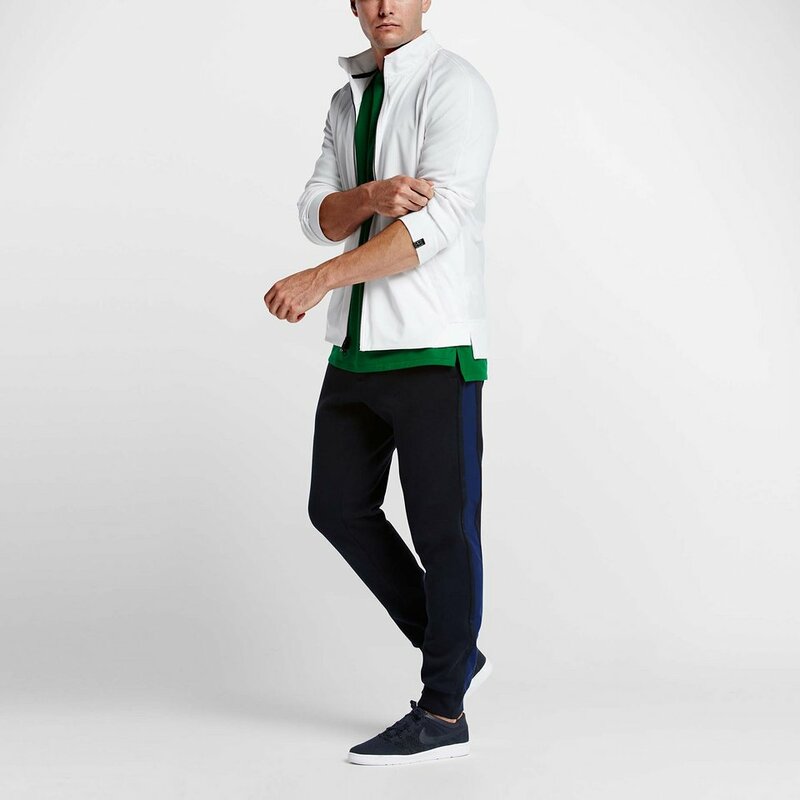 And I’m like, “Well I’m just going home…?” So we are very used to tennis players just wearing tracksuits wherever we go, and I’m part of that, too, because it’s just very comfortable. And that’s why I thought: Let’s make a collection that is very comfortable, is stylish, and is a very on- and off-court kind of thing (but more off-court) and I want it to be more street style. Presented by NikeLab, the NikeCourt X Roger Federer Collection will be available at the NikeLab 1948 LDN store on June 23, with releases online and in select Nike stores on June 30. From start to finish, watch every match from the championships, Wimbledon, with WatchESPN on FedFanTV.